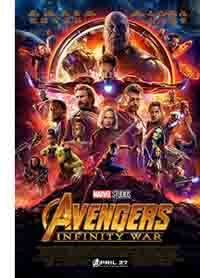 ...which is an intricate thought-provoking essay by Isaac Cates, editor of the comics anthology Cartozia Tales, on Avengers: Infinity War (2018) and its dismissal not only of the character arcs in other Marvel Cinematic Universe movies but of the nature of serialized fiction itself. I have a couple of things to mention before I get into saying what I want to say about Infinity War, first among them being that this essay is going to contain spoilers for essentially every movie and every other text I'm talking about. At this point, if you're avoiding spoilers for any of these movies, I can't help you. I'm here to talk about the way this movie ends. The second thing I should get out of the way is that although my angle on the movie is one of critique, I basically enjoyed the experience of watching Infinity War. It did a lot of ambitious things remarkably well. The action pieces, often involving characters with a wide range of powers, were fun and mostly legible. I was pleasantly surprised by how much the directors seem willing to let their characters age  Stark and Banner are going gray, and not in the obviously fake Dr. Strange / Reed Richards white-at-the-temples way. 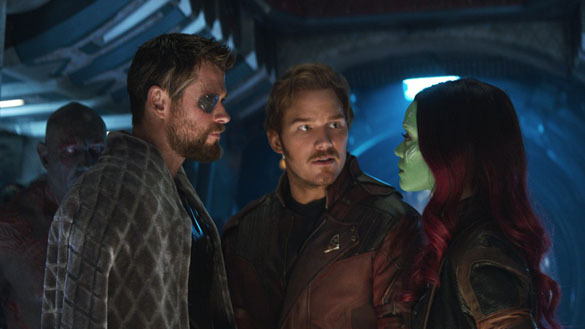 The interactions between characters from different parts of the MCU felt mostly right, and for every clunker (like Drax and Gamora's cartoonish infatuation with the unconscious Thor) or dubious decision (I think Dr. Strange should command respect with solemnity, not cocky swagger) there were keepers like the scene where Rocket, the sweet rabbit, realizes he needs to buck Thor up and does his best to bond with the thunder god. I even liked the local-cuisine gag and cruel foreshadowing of the sign in Edinburgh that promises "We will deep fry your kebab" right before Vision is abruptly skewered and electrocuted. That's a nice detail, and it shows that a level of care and craft went into the movie even at the level of set dressing. But I'm actually here to talk about the thing that presumably comes before the set dressing and the action choreography, before the jokes and emotional notes and even, presumably, the character designs: I want to talk about plot, and specifically the large structures of plot, and what they mean. Maybe I wouldn't have disliked Infinity War so much after the fact if I hadn't been spending so much time lately, in the classes I teach, thinking about plot as an architecture of expectation. I have told my students that pretty much any plot will imply, in its beginning, a set of possible ways it can end, and a set of expectations for the reader about what counts as a satisfying ending. Once we know that Hamlet's ghost father has asked for vengeance, we're not going to be satisfied without it: a rapprochement with Claudius is possible within the world of Elsinore, but it's off the table as a possible plot resolution. The range of acceptable endings is conditioned by our sense of genre, of course, but mainly it comes from the expectation a work asks us to feel once its plot starts moving. This is one of the reasons that, even if you aren't aware of the release schedule for Marvel Studios or the investment they now have in characters like Black Panther, Spider-Man, and Groot  though as Gerry Canavan points out, that's reason enough to be sure  you have to know that this story can't end with Thanos victorious. As soon as his plan becomes clear, your terms for narrative satisfaction include his defeat. 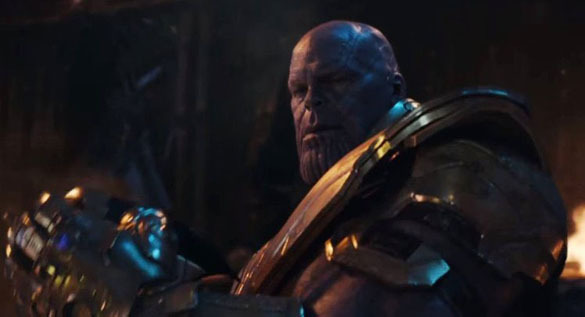 And of course most of us knew, going into the movie, that it was the first of two parts, and that the ending wouldn't actually give us Thanos's defeat. We must have expected a cliffhanger. But the ending we received  the ashy disintegration of half of our heroes, many of whom we really care about; the mournful silence of stunned heroes with no plan to carry them forward  feels like a hollow lie. Infinity War really asks us to believe that the disintegrated heroes are gone for good. It turns in the war-movie tragedy trope of the gutshot innocent gasping to his commanding officer that he doesn't "feel so good" before going limp in death. It wants us to feel the awful shock and trauma felt by the surviving half of the heroes (coincidentally the entire roster from the original Avengers movie, assuming Hawkeye didn't crumble back at the farm). But we know better. We can't help knowing that the story doesn't end this way, because the movie and its genre have told us what to expect, and it's ridiculous for Infinity War to pretend that this is really the end. In fact, it isn't merely ridiculous. It's also a travesty. The other thing I keep telling my students is that a narrative accomplishes its meaning by the way it concludes. The opening of a plot may raise thematic questions; these questions may also arise, get more complicated, and get troubled by the events that happen along the way. But the conclusion of a plot also articulates the conclusion of these themes, the answer to these questions. Of course it's also possible for a plot to end on a note of thematic ambiguity  good stories do that all the time  but that sort of ambiguity is also a conclusion, and is in the end the thing those stories choose to say. The story's theme, the material of meaning it's chewing on, is a way to say what the movie is about without having to say a word about the plot. Raiders of the Lost Ark is about the desire for power; Jaws is about primal fear. But if you frame the thematic conversation as asking a question  "What sort of responsibility comes with great power, if the one with the power is still a kid?"  then the answer comes in the story's conclusion. If Infinity War is asking a thematic question, that question has to do with the circumstances under which it makes sense to sacrifice in order to save a great number. 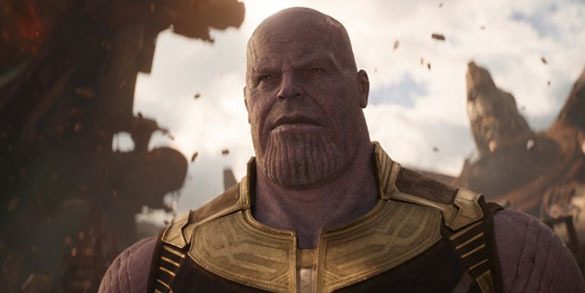 (The movie suggests that Thanos wants to kill trillions, but that seems like a low estimate  just a thousand or so earthlike planets in all the Marvel universe?) The question of sacrifice is all over the movie. Captain America asserts that "We don't trade lives," and Vision both challenges this assertion and later repeats it. Both Starlord and Scarlet Witch are asked to murder their beloveds for the greater good, and they both try to see it through. Dr. Strange is asked to destroy the Time Stone for the greater good, but refuses; despite having asked to die rather than give up the location of the Soul Stone, Gamora somewhat inconsistently caves when she sees her sister tortured. Thor puts his life on the line to forge a weapon only he can wield  a strange sort of self-sacrifice, but "only if I die." 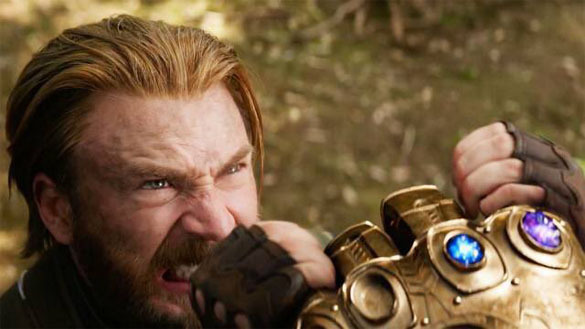 Thanos wants to murder half the universe to save the other half from misery; he must sacrifice the only person he loves (if that's really love) in order to win the Soul Stone. So, if Infinity War is asking whether the needs of the (extremely) many outweigh the needs of the few, why doesn't its ending have even a word to say about that? Wanda makes the tough moral choice that the movie seems to approve of, but Thanos's time-trickery immediately undoes it. Quill also has his decision to kill his beloved instantly undone by an Infinity Stone, so the heroes are clearly willing to do it, but the movie won't let them. (Does anything other than the narrative's denial of that choice make it different from Thanos tossing Gamora off a cliff? The ending doesn't address this.) The characters who die at the end don't choose to sacrifice themselves. Even Thanos doesn't choose who dies: they die by studio fiat, or by random chance if you want to believe that randomness actually operates in a plot this engineered. In fact, the only characters who actually die in deliberate moments of climactic self-sacrifice are the dozens or hundreds of Wakandans who must have been slaughtered by Thanos's ravening monster-army. But they don't even have names, and the movie doesn't register their deaths. (Same goes for the monsters, I guess, and for Proxima Midnight, Cull Obsidian, and their crew, dying for loyalty to their dumb Malthusian overlord.) Without measured, deliberate, on-camera sacrifice in the final confrontations, we totally lose the movie's sense of its own meaning. Infinity War may not have a conclusion, but it has an ending, and the ending is ignoring the movie's best attempts at meaning something  or at least meaning something beyond a couple of kids smashing their action figures together and making up rules for who wins the fight. Furthermore: its own ending, its own meaning, isn't the only one Infinity War deliberately disrespects. Characters we loved in Thor: Ragnarok, like Tessa Thompson's stunning Valkyrie and Taika Waititi's light-as-a-breeze stone-man Korg, are simply gone, and Idris Elba gets only a single line as Heimdall before he's skewered, Vision-style, and also dead for good. Clearly Infinity War wants us to understand that the stakes are high. But either this movie doesn't grasp the meaning of what it has just mass-murdered, or it doesn't care about the hope Ragnarok gave to its ship of refugees. Waititi's Ragnarok is a fun, visually outrageous movie, but it also has a strong political point to make about empire  that its power inevitably arises from dark, corrupt abuses; that these abuses are not merely limited to the backward attitudes of history ("prisoners with jobs," y'know). In its end, Ragnarok is almost didactic about the sympathy we should have for refugees. It imagines Earth as a welcoming place for the survivors of the ruined Asgard, in a way that should remind us (in Trump's America) that noble, imperiled people here on this world also need the shelter we can offer. And it reassures us, with Chris Hemsworth's easy Australian smile, that of course our sympathy, our affection for foreigners, will grant a new home even to Loki along with the innocents. And then a more mainstream blockbuster comes along, less than a year later, and annihilates the ship of refugees before it can reach our shores. 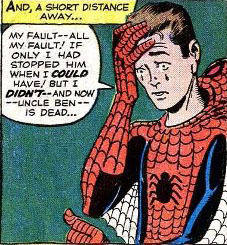 The same sort of thing happens to the meaning of Spider-Man: Homecoming, which ostensibly settled the question of Peter Parker's great-power / great-responsibility struggle: in the end, Spidey decides to stick to his neighborhood and finish high school instead of becoming an Avenger. And the movie definitely frames this as the right choice, even making Tony Stark look like a bit of a heel at the end for making the offer, after he'd tried to defend Peter from the dangers of the superhero world for most of the movie. 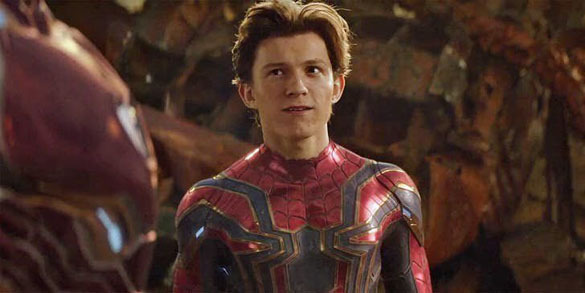 In other words, if Homecoming has a meaning, it's that a kid should have a chance to be a kid before he has to face the adult world  an interesting revision of the core Spider-Man story, for sure, but one we were happy to accept, because it promises continuing tension between innocence and peril returning in a sequel. …Except that Infinity War wants to capitalize on our emotional investment in the young, innocent Spider-Man, so the very next time we see him on film, he unthinkingly ditches a bus full of his classmates and engages some very dangerous aliens in Manhattan. (By swinging across the East River, he's already stopped being the friendly neighborhood Spider-Man.) He waves away his squabble with Iron Man over whether he should be thundering across the galaxy toward a confrontation with Big Evil, but by that point the ship has sailed, and the meaning of Homecoming has been shot into space by dramatically unequal atmospheric pressures. As if breaking Homecoming and Ragnarok wasn't enough, Infinity War also wrecks or rewrites the ending of Black Panther. If Black Panther meant so much to so many because of the way Wakanda represented a sophisticated, richly diverse nation of color, it hurts to see Wakanda's elite battalions treated in the climactic battle as monster fodder. 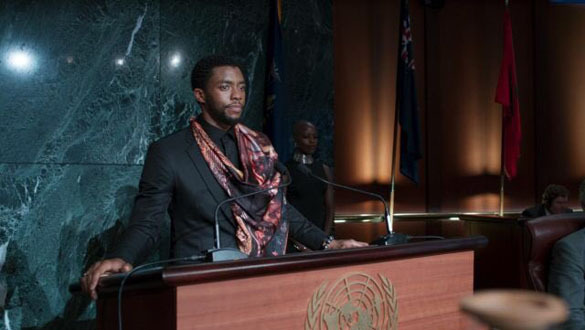 If the message there was that Wakanda's isolationism belonged in Africa's colonial past, and that its privilege and power required T'Challa to engage with the rest of the world  that wealthy nations (*cough cough* Trump's America *cough cough*) are morally obligated to share, especially with people who have history and politics working against them, even if it means losing something of the privileged nations' specialness  if, in the end, the meaning of Black Panther was that Wakanda needs to open its borders, then one of the first things Infinity War does is to activate a force field around Wakanda. And on the other side of the force field, there's a horde of hungry, interchangeable, subhuman aliens. These aren't people; they're animals. They're more frightening than anything Trump imagines on the other side of his wall, but mostly for the same reasons: foreignness, energy, and numbers. I suspect that the Russo brothers didn't realize that their movie was implying a justification for racist isolationism, but if you set Infinity War against a reasonable reading of the end of Black Panther, that implication is hard to ignore. Oh, sure, there's the joke about how Okoye wanted Starbucks instead, but all of the hope and aspiration of "Wakanda Forever" seems to get chewed up under the war wheels as the movie climaxes. What does it mean for Black Panther to bring T'Challa back from the edge of death, or to have him learn a painful lesson by communing with his ancestors, if arbitrary chance and a snap of some chunky lilac fingers can turn him to dust before he fulfills his new plans? Why, it's almost as if the big "event" of Infinity War means more to Marvel Studios than its really successful (and meaningful) movies of the preceding year. That specific stupidity is almost understandable. The plot logic of the grand-stakes company-wide crossover obliterates all the subtlety of its component narratives, and they've been planning Infinity War for a long time. I'd bet that the meaning of Ragnarok, Homecoming, and maybe even Black Panther emerged in the process of making the movies, whereas the fact of Infinity War (if not its meaning) has been grimly looming on the horizon, insisting on its making and its form, for most of a decade. If its production schedule had been more malleable, or its writers more in tune with the meaning of the MCU movies being produced almost simultaneously, then some of these problems might have been accommodated. Maybe in among the fourteen million, six hundred, and five alternate versions of this script, there's one where Spider-Man stays in Queens, or at least feels scared rather than eager to step out into cosmic combat. Maybe there's a version of the script that reflects the emotional maturity Peter Quill seemed to be reaching at the end of Guardians 2 rather than resetting him to swaggering insecurity as soon as a prettier, brawnier Chris arrives. Maybe some version sets the climactic monster battle somewhere other than Wakanda, with the Dora Milaje deliberately volunteering to join the fight instead of being forced to defend their hidden homeland. Maybe there's a version where Thanos pries the Tesseract out of Loki's hands without murdering a whole ship of refugees, but that would probably take some major rewrites  or, I suppose, Loki reading the situation and fleeing before the confrontation, rather than seeking safety in numbers on a transport ship full of civilians. All right, let's do this. Okay. I have a script fix that addresses most of these problems and the bigger lie of the dissolve-into-dust ending. I don't pretend this is perfect, but I think it might be better. Imagine a version of Infinity War that starts with Loki seeing the huge ship, intuiting or learning somehow that it's Thanos looking for the Tesseract, and getting Heimdall to beam him through Dr. Strange's window instead of sending the Hulk. Loki shows up asking for asylum, squabbles with both Strange and Stark, but then briefs the heroes on what's coming their way, with enough time for them to make what should be an easy phone call to Steve Rogers. A.) Let Hulk be the one who risks getting burned up in the Forge of Nidavellir, maybe? But in my version, we'd end this movie looking like Thor can't get his new weapon  maybe even let him believe, for the time being, that the dwarves of Nidavellir are all dead; don't show Peter Dinklage until the sequel. While we're at it, maybe let Heimdall and Valkyrie accompany the main Guardians team to Knowhere? It would have been fun to see Korg interacting with Drax. But that recombination is sort of trivial, and this is trivial to my script fix, really. B.) Iron Man's team that follows Dr. Strange and the Tesseract into space is deliberately chosen, if quickly, to be a group of heavy hitters. Let Loki be one of them. Another group stays behind to protect the Mind Stone, get it out of Vision's head, and destroy it. But both groups know that rescuing Dr. Strange and ambushing Thanos are the primary plan, and that's where the emphasis of the movie and its plot will fall. C.) But the main thing for this movie is the threat of facing Thanos on Titan. The Guardians (but not the Thor group) join Iron Man and Dr. Strange, and it looks like this could actually mean victory. However, during the difficult battle, some of the heroes are badly injured (or even killed, if you have to go there in the name of the theme of sacrifice). Eventually, Thanos gets the Space Stone, uses it to send some of the surviving heroes very far away in an instant, and gets the Time Stone from a wrecked Dr. Strange (hurt his hands!). Abruptly he has five of the six Infinity Stones with almost no one standing in his way. Let him tell the broken heroes who remain that he knows perfectly well where to find the final stone, and let him warp away. They have no way to help their friends in time. Meanwhile, trouble besets the Avengers remaining on Earth. Shuri has had setbacks, and may be convinced that she can't get the last stone out of Vision's head after all. He may have to die to prevent it from falling into Thanos's hands. Captain America says everyone is willing to fight to defend him, and we see the brave band of a dozen or so ready heroes, then pull back to see a monster army of ridiculous numbers, a trio (at least) of super-powerful Children of Thanos, and the big purple fellow himself ready to unleash hell on them. "I have a destiny," he says, "And I am pleased to greet it. Today, whatever it costs, I will have that final Stone." And then the movie ends. That would be a cliffhanger, rather than a fake-out pretending to be tragedy. Maybe it's a little more predictable, but it's also the sort of provisional ending that would feel satisfying. We'd know, of course, that the heroes would triumph in the end  the genre tells us that before we even set foot in the theater  but we wouldn't know how. We'd be poised, and tense, hoping to see how they'd survive the impossible odds, and not knowing what they'd need to sacrifice to get there. The specter of imminent death would hang over the entire intervening year. True, we'd be denied the fake-out shock of Thanos's victory, but imagine what it would feel like if it happened forty minutes into the second movie, scuttling everyone's notions of what the rest of that movie would look like. That's the right place for the moment of the heroes' despair: the tense cliffhanger ends one movie, and things seem to get better as the second begins, then get dramatically worse, so that there are new stakes and new obstacles we couldn't have predicted in between the movie and the sequel. Story structure isn't a set of arbitrary rules. It's something we can glean from observing the stories that work for us and the way they're built: the way they invite us to expect a particular ending, the way they make that ending hard to achieve, the way they subvert and satisfy our plot expectations. As a pattern, that shape  the simplest version of which is that famous Freytag triangle  works because it's the way stories say something. It's a way of asking a question about ideas, having characters try out responses that imply answers, and drawing a conclusion. If Infinity War wants us to think about the virtue of sacrifice, it's probably not a good idea to make the villain the only character who actually sacrifices anything. It's a bad idea to pepper the conclusion with deaths that are not heroic but random, not willed but enforced by that same villain. And it's a terrible idea to imply, by plot logic and by our knowledge of the studio's schedule, that none of those sad deaths are real and final anyway. So much of that problem could have been solved simply by relocating the provisional ending to a different part of the story. The movie might only have been a little more than two hours long, but it would have left us really eager for the second half, because of the natural way that story tension works. Isaac Cates is a lecturer in the English Department at the University of Vermont and the editor of the kid-friendly adventure series Cartozia Tales. He previously wrote an examination of Captain America: Civil War for Unseen Films. He is also available for script checks, Marvel, if you want to get stuff like this ironed out before your start spending money on special effects.